Even in this city famous for its average weather, there are still some days when the thought of ice cream pops into your head and you can't rid yourself of it. Whether there are some kind of subconscious marketing giants at work here - ensuring you don't forgo this creamy sweet treat for the nine months of the year when London doesn't really have ice cream inducing temperatures - or it's just a hang over from being a child and wanting ice cream all the time, this fact of life is here to stay. 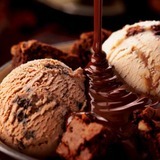 When the weather isn't right for it, one of the best places in town to halt your creamy-cravings is the Häagen-Dazs' Cafe. Yes, a cafe, but with a menu made up almost exclusively of Häagen-Dazs ice cream. Oh, you can have a coffee – but one with ice cream in it, affogato style, is even better. And you can have a brownie or a cookie, but the same rule applies: everything's better with a scoop or two of Häagen-Dazs added to it. Even your cocktail, of which they serve several. There are a few ways you can engage with the Häagen-Dazs cafe experience. 1. Opt for one of their sundae style offerings – helpfully illustrated in their lip-smacking-ly full colour menu. Some of the most temptingly titled include: Chocolate Journey (which is best described as a bit of everything chocolate), Brownie Explosion, Caramel Crêpe Seduction or Praline Caramel Crunch. 2. Go all out and order a Häagen-Dazs fondue to share – which is what you're imagining it is: mini scoops of ice cream, cubes of brownie, cookie and fruits and a big bowl of Belgian milk or dark chocolate to dip them in. 3. Or choose your own adventure and build your sundae from scratch selecting from their 24 flavours of ice cream, seven different sauces, seven added extras, served six different ways. Can you feel the wonderful warmth of an impending sugar rush yet? On Leicester Square, the Häagen-Dazs cafe is not the classiest of joints, but it's not too bad either, with two floors – the upstairs manages to be a little clubby even – decent table service, and a take away section if you need a fix on the go.